The Magellan RoadMate 9416T-LM high-sensitivity GPS system features a 7" touch screen to provide an instant access to navigation. The GPS has exclusive QuickSpell® technology with SmartCity Search. This excellent device features the exclusive and highly acclaimed OneTouch™ favorites menu. Traffic camera alerts by PhantomALERT, provide audio and visual warnings of fixed red light and speed cameras along your route. The RoadMate 9416T-LM gives you confidence while on the road with premium features including junction view, landmark guidance, speed limit warnings pre-loaded maps of United States, Canada and Puerto Rico. The best parking feature helps you find parking garage locations, hours of operation and directions to the entrance. The built-in map shows your location, destination and route in 3D for a clear realistic view of your surroundings. The Magellan Roadmate 9416T-LM has many exciting features for users of all types. It's one of FactoryOutletStore's best selling . You can extend the lifetime of your Magellan Roadmate 9416T-LM with the purchase of a FactoryOutletStore Factory Protection Plan. See the Magellan Roadmate 9416T-LM gallery images above for more product views. FactoryOutletStore stocks a full line of accessories like 7" GPS Case, Car Charger, and Dashboard Disk Mount for the Magellan Roadmate 9416T-LM . 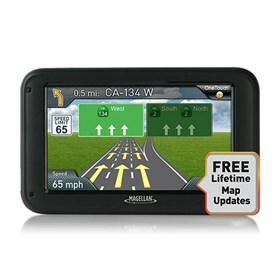 The Magellan Roadmate 9416T-LM is sold as a Brand New Unopened Item.